In this article we will focus on how to work with Web Parts in our web application. We will customize the Web Part as per the users requirement. We will also see how to drag and drop web parts from one zone to another zone. ASP.NET includes 13 Web Part Controls in the designer Toolbox. the web part controls and classes can be found inside the System.Web.UI.WebControls.WebParts namespace. Web Parts are components with predefined functionality. It can be customized as per the user requirement and embedded in a page. 1.To improve a site's consistency. 2.To allow users to customize the web page content as per their specific needs. 3.We can also exchange information between Web Parts, allowing the settings that are made in one Web Part to propagate to other web parts. to the left, a title bar at the top, multiple news columns, and other components such as weather reports and stock quotes and a footer. Web parts generate client-side menus so that end user can provide customizations easily using the UI. There are three ways of creating ASP.NET Web Parts managed by the WebPartManager class in your web page. 2.Use an existing ASP.NET control (such as Label) to define the Web Part. It is simple and easy. 3.Create your own custom control and derive it from the WebPart class. this method is time consuming and tough to create but it provides more flexibility. Lets use see each of these methods of creating a web part control and using it in our site. Step1:Lanuch visual Studio 2012 -> File -> New -> WebSite -> ASP.NET Empty Website -> Name it as "WebPartDemo" -> OK.
Step2:Add a Web User Control to the application. Right click the project in the solution explorer -> Add -> Select WebuserControl -> Name it as "WebPartUserControl". 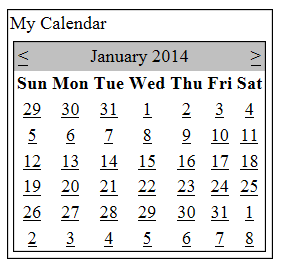 Step3:Drag and Drop a calendar control to this user control. Step4.Open Default.aspx page -> Go to the Design view -> Now drag and drop the WebPartManager control to the webpage and then drag and drop the WebPartZone control. In this WebPartZone control, drag and drop the usercontrol from the solution explorer to the WebPartZone. Notice the tile added to the user control it is displayed when the usercontrol is displayed on the webpage. Step1: Go to the Source view of the Default.aspx page -> Drag and Drop the WebPartZone control. 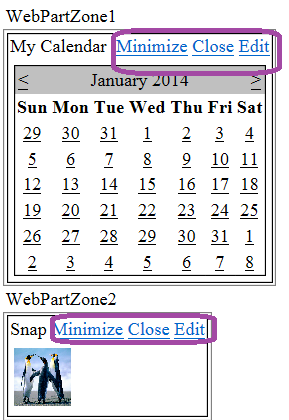 Step2:Now add a Zone Template inside the WebPartZone control. Inside this ZoneTemplate. Create a Label and inside this label create an image control and set its ImageUrl property to the existing image. Label control acts as a container control in the WebPart. Step1:Add a new class to your application and name it "CustomWebPart". Step2:Inherit this class from the WebPart class. Step6:Please make sure that the WebPartManager control is added to the page. Press Ctrl+F5 and see the output as shown below. Let us see how to provide the user the ability to customize the webpart as per their requirement. For this user must be authenticated and the webpart must be in display mode other than the Browse display mode. BrowseDisplayMode: In this mode user can perform basic operations such as minimize and close. This is the default mode for a webpart. DesignDisplayMode : This mode enables users to drag Web Parts to different locations. EditDisplayMode: This mode enables users to drag Web Parts. Users can select Edit from the Web Parts menu to edit the title, size, direction, window appearance, and zone of Web Parts by using AppearanceEditorPart and LayoutEditorPart controls. In order to use this mode, you must add an EditorZone control to your webpage, and then add either AppearanceEditorPart or LayoutEditorPart, or both the editor parts. CatalogDisplayMode: This mode enables users to add additional Web Parts specified by using a CatalogZone control. ConnectDisplayMode : This enables users to establish connections between controls by interacting with a ConnectionZone control. For demo purpose, I am simply authenticating a user using below code. It will set the authentication cookie and makes the user authenticated. Don't use it in real time and provide code for proper authentication. Set the DisplayMode property of the WebPartManager control to Browse. Now browse the Default.aspx page. 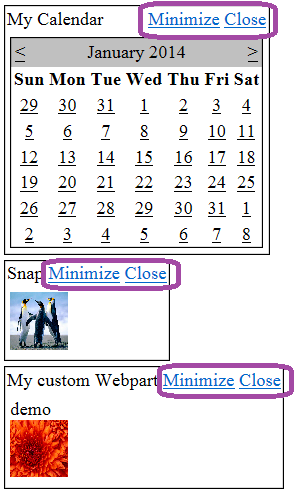 You will find Minimize and Close links for every webpart in the page as shown below. Now change the DisplayMode property of the WebPartManager control to Edit. Now browse the Default.aspx page. You will find Minimize,Close and Edit links for every webpart in the page as shown below. When you click on Edit link, you will find options to change the Appearance such as Title,Chrome Type,Direction, Height and Width properties of the webpart. Click on Apply and Save. This will apply the settings to the webpart.